You've launched a Facebook page and a Twitter feed, and you've got a few hundred followers on each. Maybe you even monitor and update them regularly. Congratulations: that's a good start. Traditional social media now is entering its second decade, as measured from the launch of the seminal social site, MySpace, in August 2003. In early years, social media was seen as the Internet's crowded community promenade, safely sequestered away from the "serious" business and media websites that once defined the Internet's popular profile. Today, social media has grown up. Instead of being a place your kids hang out, social has evolved to become the default mechanism for public interaction between any two - or more - parties online. Whether the conversation is between a store and its customers, a TV anchor and her upset viewers, or a firm and its (prospective) clients, social is virtually always the medium. As you might have guessed from this post's title, that medium has grown well beyond the marquee names of Facebook, Twitter, and LinkedIn. Those forums remain incredibly important, to be sure, but it's not enough to plant your firm's flag there and call it a strategy. If you're not really sure what your next social step entails, The Conversation Prism, released this summer by Washington, D.C.-based design firm JESS3 in collaboration with digital analyst Brian Solis, might help you get your bearings. 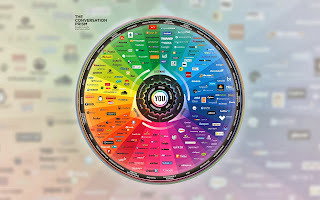 The Conversation Prism organizes the social Web based on types of services, encompassing everything from social marketplaces like Etsy and LivingSocial, to location-based apps such as Foursquare, review sites such as Yelp, livecasting services such as Livestream, photo sites such as Instagram and 500px, and curation sites such as paper.li and Pinterest. It's true that many of the platforms shown on this infographic predate and challenge what we've come to think of in the past few years as "social media," and that's the point. The graphic demonstrates, in a powerfully visual way, how social media is no longer something we do, it is the way we live. It is not a fad, it is not going away, and its influence is transforming the way we do business. First released in 2008, the Conversation Prism has changed over the years, reflecting the evolution of the social Web it monitors. In the latest version of the graphic, 122 social media services have been removed, and 111 new ones added. One aspect remains constant, though. At the center of the prism is "you," the person or business looking to make their latest social move and choosing platforms to meet their goals. 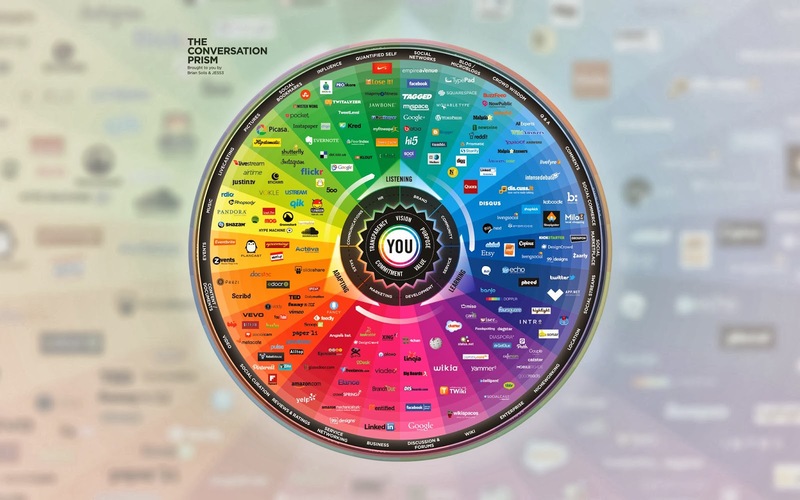 Whether that goal is listening, learning or adapting social for your company's use, the Conversation Prism can help guide a social media strategy, reinforce a strategy already in place, or inspire management teams to think about social in a new way. What social media platforms does your company use? Have you identified any new platforms you would like to use? Share your thoughts in the comments. Note: Click on the graphic to enlarge it for easier viewing.